For today’s muni market it’s all about technology, transparency & EMMA. The most effective way to reach your investors. Present your deals in a whole new way. Engineered for today’s muni market. We collaborate with bond counsel and utilize a unique 62 point quality assurance process to ensure a secure and accurate Official Statement. Using the industry’s most advanced electronic distribution platform we share your deals with investors and quickly bring them to market. Our MuniBond Roadshow service is a powerful tool to present your deals with pictures and sound while capturing your audience’s data. Meet MuniOS our ground breaking distribution platform. It’s a website we designed and built from the ground up just for Official Statements, and it’s now home to over 30,000 deals. 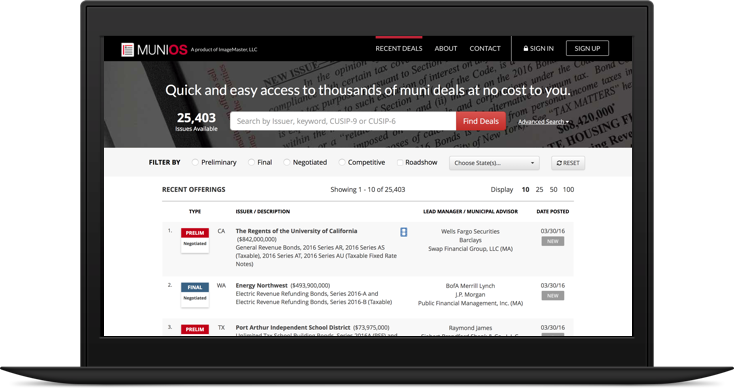 MuniOS.com receives thousands of visitors per day, so it’s the perfect place to get additional exposure and transparency for your deals. Every Official Statement that we distribute gets posted on MuniOS.com for the life of the bond. Over 70% of the muni market uses us. Why? Because we’re passionate about our industry. There’s a simple reason why working group members continue to choose us for the printing and electronic distribution of their Official Statements: we do things differently. ImageMaster doesn’t just print your Official Statements, we use cutting edge technology to ensure that your municipal bond offerings reach investors quickly and accurately. Our passion and commitment to providing exceptional service to working group members is not just talk, it’s what we do. That’s why over 70% of the muni market* depend on us to get results on their deals, each and every time. *Based on the industry’s combined par amount totals for all municipal bond deals in the most recent calendar year. Source: Bloomberg. Want to see MuniBond Roadshow in action? MuniBond Roadshow is our online presentation service developed exclusively for municipal offerings. We took our proven MuniOS delivery platform and enhanced it by integrating MuniBond Roadshow to help you communicate directly with your investors. Captivate your audience with high definition slides and synced audio for a streamlined experience. Our MuniDashboard™ analytics tool will allow you to securely access and download your audience data in real-time. Our advanced production workflow streamlines your official statement preparation while enhancing your marketing efforts. In the event of a change on an OS that is already released, we will automatically alert all users that have accessed your deal. We offer complimentary EMMA filings with every Official Statement. Our in-house developed software ensures accurate filings. You can rest assured that a fully-secured PDF of your Official Statement will be distributed and posted within 1 hour or less of final approval, no matter the time of day or night. We expect you to revise your Official Statement, and we prepare for those revisions accordingly. You won’t pay additional costs for changes, and we’ll always check them for errors. We use a state-of-the-art process to digitally sign and protect your electronic Official Statement. 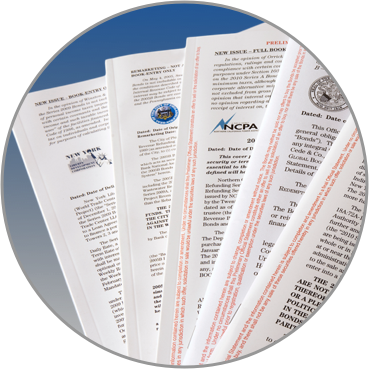 This process validates your document and prevents potential tampering. Distribute your deal when it’s convenient for you. Our team of Muni Experts are available after hours. Weekend service can be easily arranged to ensure that your deal is promptly released. Let us help you bring it to market. Working group teams love working with us. Read their comments. Feel the love. I also wanted to say thank you to ImageMaster the staff who handled every need and request of the Authority with the diligence, care and complete professionalism. Thanks again for all your help. I very much appreciate your patience and availability. I don’t know why issuers print with anyone but ImageMaster! Thanks. Your folks are always easy to work with and do a nice job! I just wanted to extend my gratitude to you for being extremely flexible and diligent in helping us get this POS posted/printed in record time.